Kensington supplies and installs a variety of outdoor canopies and shelters for schools in the UK. We take pride in the quality of our canopy systems and the reliability of our installation work. Call us today and we will send our team to your site to complete the task. Providing a safe, comfortable and stimulating environment is one of the primary goals of every school. Students need a great place to study, rest and have fun. Our outdoor school canopies are ideal extensions of the classroom. They provide a relaxed and interesting environment, making the school a better place for students and teachers alike. Our school canopies and lean-to canopy range create an excellent outdoor learning environment, easing the strain on large classroom groups, and improving the aesthetics and efficiency of the school. 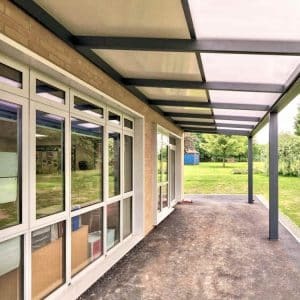 The aluminium frame-fixed school canopy system with triple-wall polycarbonate offers a low-maintenance solution that is far better value for money than steel and tensile fabric options. The integral drainage channel allows rainwater to be managed efficiently. The polycarbonate roof is available in three different varieties, to give flexibility in all light levels, and UV protection. All three models also have a 65kg/sqm snow-loading capacity. Maximum projection of up to six metres can be gained with no maximum length to allow large areas to be covered economically and quickly. A massive unsupported span width of up to six metres between posts can be achieved with this system, utilising integral steel I beam within the front lintel. Kensington’s outdoor school shelter uses a modular, universal design and removes any costly engineering and turnkey fabrication costs normally found with tensile and steel fabric structures. Combining the comforts of the indoors and the calming environment of the outdoors, our outdoor shelters for the UK’s schools take the learning outside. Our outdoor canopies come in three models, each with its own combination of features: the Spaceshade Max, the Spaceshade Lux and the Spaceshade Lite. With various frame options, glazing options and features such as integral lighting and shade, our modular aluminium systems surpass traditional steel structures when it comes to aesthetics, versatility, maintenance and costs. The school canopies are available with several optional extras. Side infill sections, lighting and heaters are all optional extras that can increase the functionality of your canopy, allowing you to use it throughout spells of cold and windy weather. 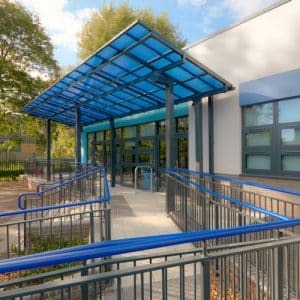 The school canopy and lean-to canopy system carry a 10-year guarantee, but the expected life-span is at least 25 years. The Kensington Lean-To Canopy will add a functional dimension to your school. Decide if you want your shelter attached to a wall or freestanding. Choose from the Spaceshade Max, Lux and Lite and specify the size and ancillary features you want to add. Check the suitability of the desired mode for its intended use and with existing facilities. Decide on design criteria such as fragility, glazing and material specifications. Let us know your requirements by calling +44 (0) 117 958 9933. For more information on our Spaceshade system, download our Spaceshade brochure and contact us today. We offer different types of outdoor canopies that are durable, stylish and easy to maintain. Depending on your requirements and the site, we will install a bespoke canopy to make a great place for learning, entertainment and leisure. Choose a canopy from our range of options. Fixed canopies and shelters are today’s de facto requirements for buildings in the modern age. Kensington’s unique aluminium modular system outperforms traditional steel structures in terms of looks, flexibility, maintenance and costs. Kensington’s lean-to canopy system is a durable, smart, and cost-effective solution to providing outside covered areas for recreation and learning. 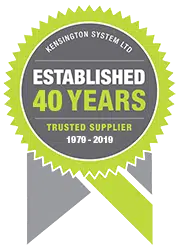 Kensington has over 30 years of experience in providing schools with smart and cost-efficient indoor and outdoor solutions. 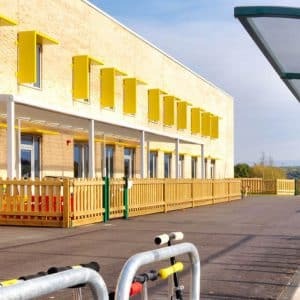 From primary schools to universities, we’ve helped designers and contractors develop outdoor extensions of learning areas, giving them advice on our Spaceshade models and their ancillary features. Our commitment to client satisfaction allows us to deliver projects on time and within budget.